Crawley Wasps manager Paul Walker says his team’s goal-laden start to the FA Women’s National League season will have made their rivals sit up and take notice. Having beaten Ipswich Town 5-1 on the opening day of the season and edged out Enfield 1-0, Wasps made it three wins from three since promotion by winning 6-0 at Norwich City on Sunday. Together with their 8-0 win over Ipswich in the League Cup last weekend, it means Wasps have now scored 20 goals in four games and conceded just once. “People in this league will be keeping an eye on our results,” Walker said. “Most of the sides will view us as one of the contenders but all of the teams at the top will take points off each other. Summer signing Sian Heather put Wasps in front at Plantation Park before Kemina Webber doubled the lead following a Rachel Palmer cross. 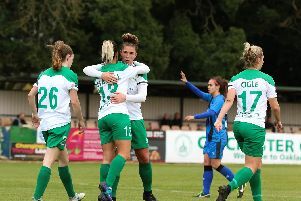 Former Wales inter-national Emma Plewa scored on her debut early in the second half after Webber capitalised on a defensive error, with Heather grabbing her second to make it 4-0. Captain Naomi Cole fired in from long distance before substitute Suzanne Davies got on to the scoresheet after great work from Megan Stow. Wasps top the FA Women’s National League Division 1 South East, ahead of Billericay on goal difference. Wasps: Gibbs; Niamh Stephenson, James, Young, Palmer; Carter, Cole; Heather (O’Hagan 76), Stow, Plewa (Measures 57); Webber (Davies 57). Sub not used: Graves.